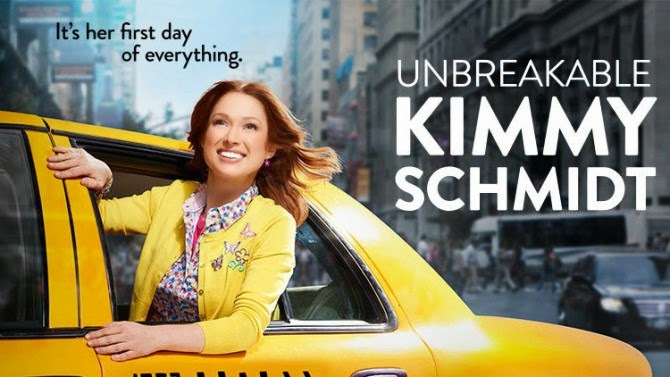 Normally I wouldn't talk about a TV show here on the blog, but I just had to mention The Unbreakable Kimmy Schmidt. The jokes are smart, but hilarious, and Ellie Kemper (Kimmy) acts her part so well. The main premise of the show is that a group of women, including Kimmy, were kept underground in a secret cult for 15 years. After being rescued, Kimmy decides that she wants to move to New York City and start the life that she missed out on. She deals with ordinary activities, but since she essentially doesn't know how the modern world works, she struggles a lot. It's co-created and written by Tina Fey, so when the internet and everyone I know blew up about it I had to watch it. I'm going to be one of those people that insists you watch this show!